Anonymous sale; Sotheby's, Monaco, 20 June 1992, lot 765. This finely-sculpted fauteuil supported by a curule-form base, reflects the 'antique' influence of the excavations at Pompeii and Herculaneum, as well as Napoleon's Egyptian campaigns of 1798 as popularized by Baron Vivant-Denon in his Voyage dans la Basse et la Haute Egypte published in 1802. This new vocabulary of ornament was swiftly adopted by ornemanistes such as Charles Percier and Pierre-François-Léonard Fontaine, architects and designers to Napoleon I. 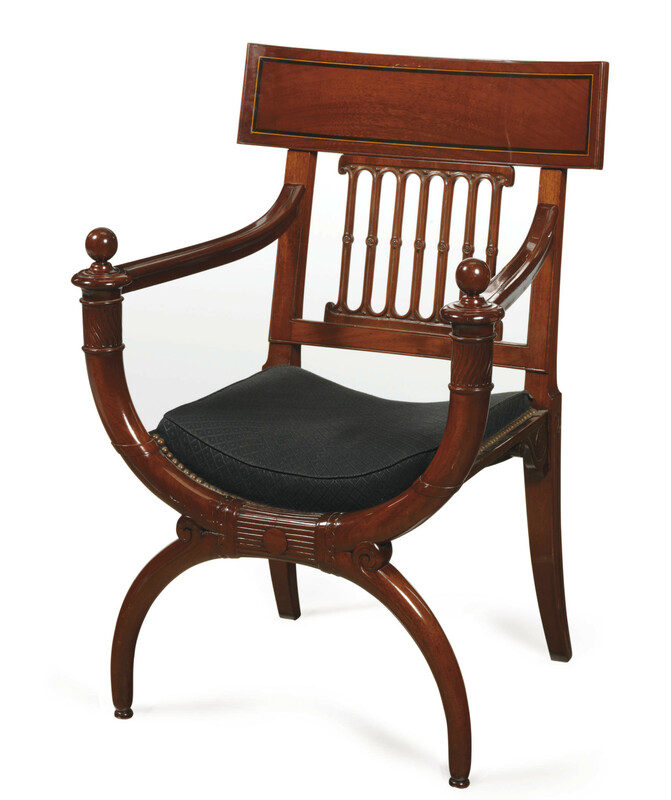 A drawing for several closely related chairs by Charles Percier (one of which is reproduced here), were intended as models for Georges Jacob, and along with two similar fauteuils signed by Jacob, are illustrated in D. Ledoux-Lebard, Le Mobilier Français du XIXe Siècle 1795-1889, Paris, 1989, p. 283 and 331. Another very closely related fauteuil in the Grognot collection is illustrated in M. Jarry, Le Siège en France du Moyen Age a Nos Jours, Paris, 1948, pl. 257.